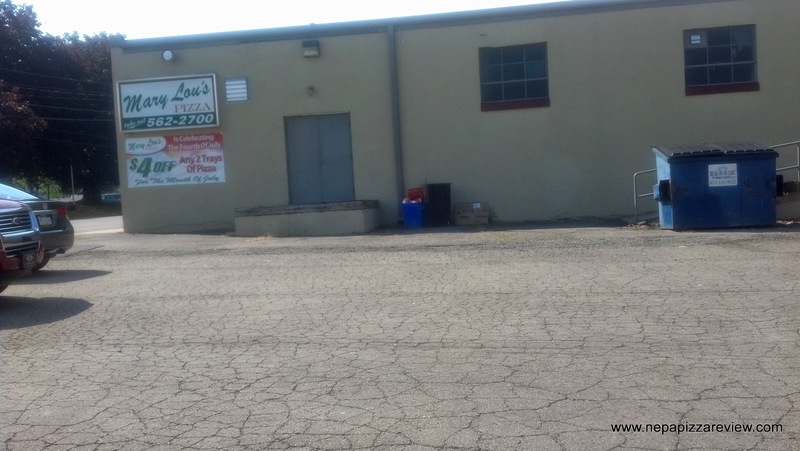 Mary Lou's Pizza - NEPA's Best Kept Secret? Sometimes when I go on a pizza review, I'll pick my pizzeria based on where I am on a given day, sometimes I will be in the mood to try something different, and sometimes I go on a review because a pizza is highly recommended by you the readers. 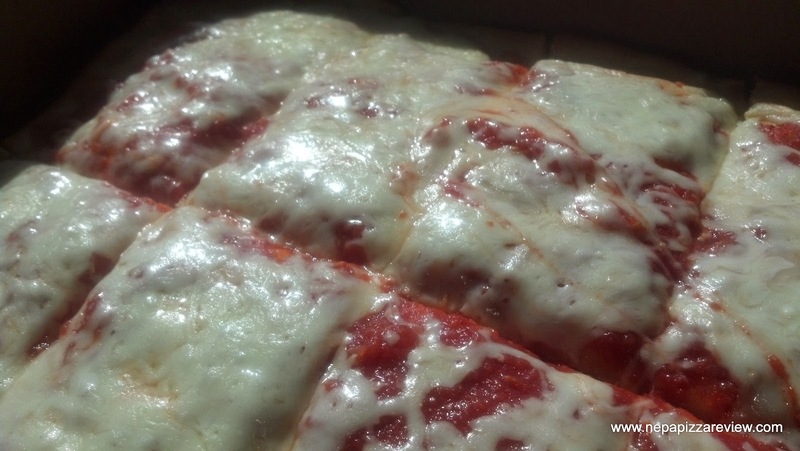 In this case, I've been told for a long time now by someone I'd consider to be a pizza aficionado that Mary Lou's Pizza in Old Forge is the best Old Forge pizza in the area and that he would guarantee that I would give it rave reviews. Now, I love a good challenge, and it takes a lot to make a bold statement like that and put your pizza reputation on the line with me! As my friends know, if you recommend a few clunkers to me, I sort of stop listening to their pizza insight. So mister pizza aficionado - your reputation is officially on the line here! I must say, it took me a long time to get to Mary Lou's because I'm not frequently in Old Forge, they have very limited hours (Thursday, Friday, Saturday), and I tend to be busy on the days that they are open. After several efforts, the stars finally aligned and I made my way down to ML's and ordered myself a pizza. I must say, when I pulled up, the parking lot and building were much larger than I expected. This place is take out only, and many take out only places resemble houses rather than residential buildings, but that's just an observation, not a judgment. When I walked in, I noticed that the interior was impeccably clean. The entire kitchen was visible, and I could see that everything was sanitized and tidy. I also saw fresh pizza crusts rising in the proofing racks, and one of my favorite old forge pizza trademarks - "the machete" that they use to cut the pizza in this area. There would be no question as to how fresh the crust was today, as I could see it before my very eyes. The two ladies inside were unbelievably friendly and struck up a conversation with me immediately as they put the finishing touches on the two pizzas I had ordered. For the record, I ordered an Old Forge Red, and a Fresh Tomato Pizza which my pizza aficionado told me to try. The suspense was killing me as the friendly pizza maker sliced my pizzas with the machete and set it in the pizza box that resembled a gift box that your mother would put a dress shirt and tie in for you on Christmas. She boxed up the pizzas while the other friendly lady placed the "Mary Lou's seal" on the box and shipped it off to my eagerly awaiting hands. The whole visit to ML's was a very positive and uplifting experience after a stressful day at the office, I found myself in a great mood, so a shout out and a thank you to the ladies at Mary Lou's for the pick-me up! So on to the pizza review. First up, I tried the Old Forge Red. 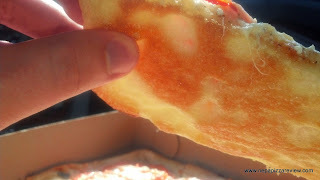 Even while I was in my car, the carefully crafted pie was so easy to pick up because it was crispy and sliced thoroughly. The crust was so wonderfully light, tender, crispy, and delicious that I probably would have enjoyed eating it all by itself. This, my friends, is one of, if not THE best Old Forge Crust that I've had. 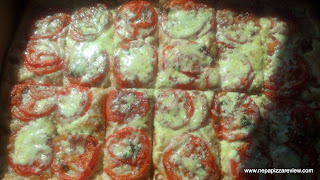 The sauce was relatively neutral, not salty or sweet, but the sweetness came from the fresh tomatoes. 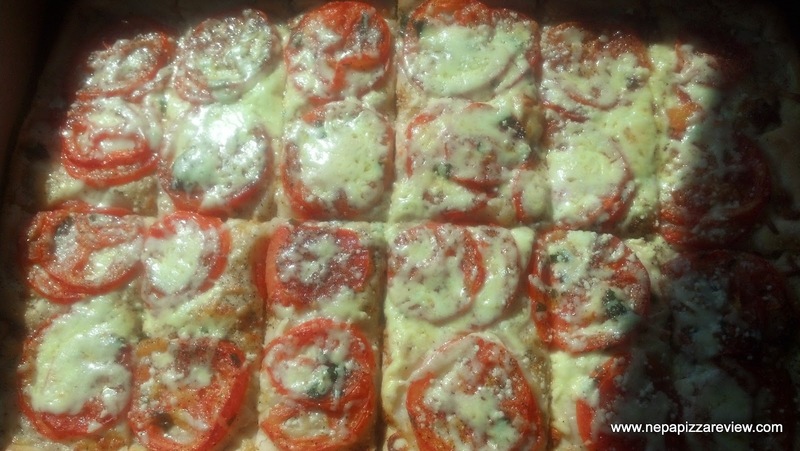 The tomatoes were so fresh, that I would have guessed they were fresh picked from a garden just minutes before the pizza was made if I didn't know better! I truly enjoyed the sauce, and I liked the sheer simplicity of letting great tomatoes speak for themselves without heavily seasoning them. The cheese was also pretty good, although I would not venture a guess at what the blend was. I was so taken back by the crust and sauce that it is possible that the cheese got lost in translation on me. The fresh tomato pizza was simply breathtaking to say the least. As you know, I usually order plain pizza, but I wanted to give this one a try to see what was so special about it. I found out very quickly when I found the same exact perfect crust as the Old Forge Red coupled with a symphony of flavors. 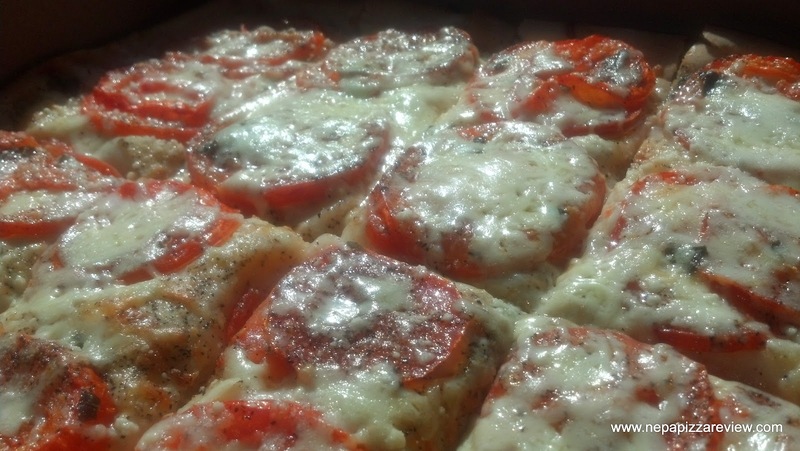 There was no sauce on this pizza, so the tomatoes had to do the talking, and talk they did! They were sliced to a medium thickness, and in places where the slices were small or thin, they doubled up on the tomato slices. The tomatoes were complimented by a wonderful blend of seasonings, fresh garlic, and parmesan cheese. This created a flavor explosion that was incredible. The cheese, which I'm assuming is the same blend as the red pizza, brought the whole masterpiece together. This was a great pizza. After reviewing both pizzas, I have to say, the pizza aficionado put his reputation on the line and passed with flying colors. Kudos to him for finding a little known pizzeria with so much to offer. I highly recommend this pizza. Note: the ratings below reflect the ratings of the Old Forge Red. 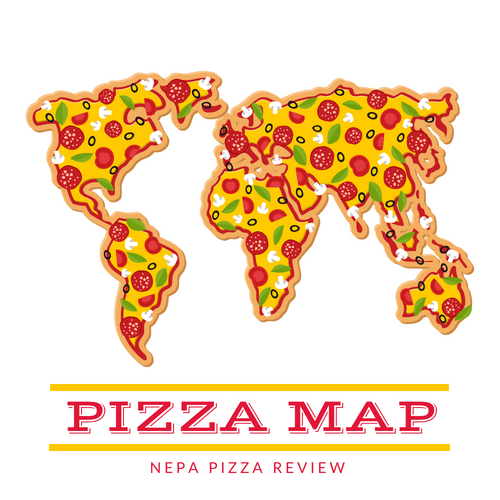 Do you have a bold statement to make about a pizzeria that I haven't reviewed yet? Check the list on the right side of my website to see what I've reviewed and tweet, facebook, or email me your bold statement so I can put YOU to the test! Great review & pictures! From your pics Mary Lou's doesn't look too different than most other Old Forge style trays that I've seen, but for some reason it looks more appealing to me, and I'm not a huge fan of that style. I'm definitely going to have to give ML's a try. Thank you! I wasn't happy with the lighting in my car with the photos, but I'm a pizza critic, not a photographer! It's definitely worth a try. Very fresh ingredients and the owner might be one of the nicest people on the planet! I recommend it if you can fit it in your schedule. So glad you reviewed this place. I have always heard great things but just never made time to stop. Now I will have to. Good you finally got to this place. It's a bit different but as you found out, pretty good. 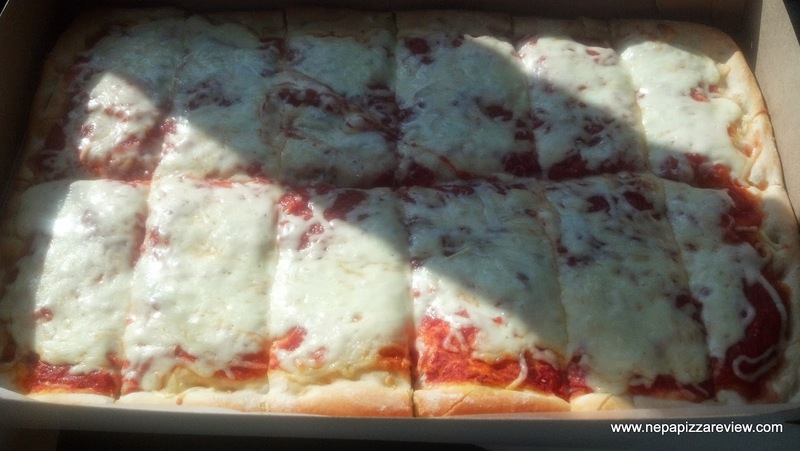 What kind of pizza does Williams' make...round or square? Are we talking wood fired oven??? This is a new one on my radar, I can't wait to check it out!